More than thirty years ago, Richard Bandler set out to discover how some therapists effected startling change with their clients, while others argued about theories while their patients waited in vain for help. Now widely regarded as the world's greatest hypnotist and one of the most brilliant minds in the field of personal change, Richard Bandler created patterns that became the bedrock of neuro-linguistic programming (NLP), arguably one of the most profoundly effective approaches for self-improvement. In Richard Bandler's Guide to Trance-formation, he returns to his roots: hypnotic phenomena, trancework, and altered states to provide a highly compelling and effective prescription for quick and lasting personal change. According to Bandler, "trance" is at the very foundation of human experience. People are not simply in or out of trance, but are constantly moving from one trance to another. We have our work trances, our relationship trances, and our parenting trances. Some of these states are useful and appropriate; others are not. With his signature wit and contrarian approach to therapy, Bandler shows how anyone can reset and reprogram their problem behaviors to reach desired alternatives with lasting and life-altering results. 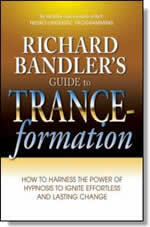 With intriguing case studies, client dialogues, and more than thirty exercises, Richard Bandler's Guide to Trance-formation, is an engaging, read for anyone, whether they are new to NLP, want to further their NLP training, or simply want to make a positive difference in their own lives. I have written many books and talked to many hundreds of thousands of people about hypnosis and NLP, and people are still confused about the similarities and differences between the two. In this book I hope to simplify the issue. My attitude is that at some level or other, everything is hypnosis. People are not simply in or out of trance but are moving from one trance to another. They have their work trances, their relationship trances, their driving trances, their parenting trances, and a whole collection of problem trances. One characteristic of trance is that it is patterned. It's repetitive or habitual. It's also the way we learn. After we're born, we have so much knowledge and expertise to acquire—everything from walking, talking, and feeding ourselves to making decisions about what we want to do with the rest of our lives. Our brains are quick to learn how to automate behavior. Of course, this doesn't mean the brain always learns the 'right' behavior to automate; quite often, our brains learn to do things in ways that make us miserable and even sick. We learn by repetition. Something we do enough times gets its own neuronal pathways in the brain. Each neuron learns to connect and fire with the next one down, and the behavior gets set. Sleeping and dreaming are important parts of the learning process. Freud thought of dreams as merely 'wish fulfillment'—and maybe for him they were. I regard dreaming as unconscious rehearsal. If I do something I've never done before, I tend to go home, go to sleep, and do it all night long. This is one of the functions of rapid eye movement (REM) sleep. REM sleep is the way the unconscious mind processes what it's experienced during the day. It's literally practicing repetitively to pattern the new learning at the neurological level. Quality information and quality material are important to the learning process. If the brain isn't given anything specific to work with, it processes nonsense. If we plan to take control of our learning, we need to understand that it's not only repetition that is important but speed as well. The brain is designed to recognize patterns, and the pattern needs to be presented rapidly enough for the human to be able to perceive the pattern for what it is. Most people have drawn a series of stick figures in the margins of their schoolbooks, then flipped through them to make the figure appear to move. Each page has on it a static image, but the brain will find a pattern—in this case, movement—if the images run rapidly enough. We wouldn't be able to enjoy movies without this process. We'd never be able to understand the story if we only saw one frame a day. So, when we dream, we're running through things to learn, and we're not doing it in real time. 'Internal' time differs from clock time in that we can expand or contract it. We learn at extraordinary speed—we can do maybe eight hours worth of work in five minutes before waking up. Sleep researchers support this idea. Subjects who report massively long and complex dreams are found through neural scanning to have been dreaming for only minutes, or even seconds, at a time. As you're settling down to go to sleep, look at the clock, and tell yourself several times very firmly that you're going to wake up at a specific time. Set the alarm if you like, but you will wake up a second or two before it goes off. This is something I've encountered in several different cultures. Some people gently bang the pillow with their heads the same number of times as the hour they want to get up. Others tap their heads or their forearms to set their wake-up time. Whichever way it's done, the principle is the same; you somehow 'know' you have an internal clock that you can set, using a specific ritual, and no matter how deeply you sleep, it will wake you as effectively as any alarm. If we can program ourselves to do one little thing—such as waking without an alarm—we can program our minds to do many things. We can decide to go to the supermarket. Maybe we need bread, milk, peanut butter, and a couple of cartons of juice. We can drive five miles to the supermarket, walk through a thousand products, maybe talking to someone on our cell phone, and still remember the juice, peanut butter, milk, and bread. Academics sometimes challenge me for something they call 'evidence.' They want to know the theory behind what I do; they want me to explain it, preferably with the appropriate research references. I've even had people ask for the correct citations for things that I've made up. The way I see it, it's not my job to prove, or even understand, everything about the workings of the mind. I'm not too interested in why something should work. I only want to know how, so I can help people affect and influence whatever they want to change. Actually, what I was saying was just the opposite. We're the only machine that can program itself. We are 'meta-programmable.' We can set deliberately designed, automated programs that work by themselves to take care of boring, mundane tasks, thus freeing up our minds to do other, more interesting and creative, things. At the same time, if we're doing something automatically that we shouldn't be doing—whether overeating, smoking, being afraid of elevators or the outside world, becoming depressed, or coveting our neighbor's spouse—then we can program ourselves to change. That's not being a robot; that's becoming a free spirit. To me the definition of freedom is being able to use your conscious mind to direct your unconscious activity. The unconscious mind is hugely powerful, but it needs direction. Without direction, you might end up grasping for straws . . . and then finding there just aren't any there at all.